This interesting piece of history gives a real incite into the civil unrest that existed in England in the late 1300's and was the prelude to the War of the Roses. Robert Yeo of Heanton Satchville had been convicted of using his servant, one John Langford to murder a neighbour, William Wyke. The murder happened after a series of writs had been taken out by William Wyke and these had been completely ignored. The case, Esturmy v Courtenay was then taken to the court of the Star Chamber and for several reasons was one of the most notable of that period. As a case of violence and oppression, it was the first of a series of trials. It was a trial on criminal charges of one of the peers of the realm, for which the council, apart from the house of lords, demonstrated its competence. Different from former cases of the kind, the matter was given a complete hearing by the council. The record too is of unusual fullness, giving a vivid narrative of the proceedings at every step. The beginning of the trouble here alluded to lay in a quarrel between Robert Yeo, a retainer of the earl of Devonshire, and William Wyke a tenant of the earl of Huntingdon. During the previous year William Wyke had obtained writs against the earl of Devonshire's retainer, which the latter had treated with contempt. Writs to the sheriff were likewise in-effective because he was in league with the same Robert Yeo. One day Wyke was caught in an ambuscade and horribly murdered at the instigation, it is alleged, of Yeo. Indictments of the persons implicated were obtained before the justices of the peace, who were in turn threatened by the earl. And so the quarrel spread until it involved many of the gentlemen of Devonshire, and was likely to cause a civil war in the neighborhood. It was clearly a case of maintenance, an attempt on the part of the earl to sustain the quarrel of another, coming under the statutes 20 Edw. III, c. 4 and 1 Richard H, c. 7.' There was also the offence known as embracery, an attempt to influence a jury corruptly, but this had not as yet been so fully laid down in the statutes.' Undoubtedly the case belonged to the council according to an act of parliament, 1 Richard II, which concede all cases involving "such high personages that right could not be done elsewhere." The Earl of Devon obviously had his own agenda, Robert Yeo was a long-standing and valued servant and Earl Edward was determined to protect him (and his servant John Langford) and he felt the judge, William Esturmy and the jury were biased. Robert Yeo was mentioned in The Liveried Personnel of Edward Courtenay, Earl of Devon, 1384-5 which listed those wearing the nobleman's livery. This was seen as a public and symbolic demonstration that served to advertise a special bond between a 'good lord' and his men, and it gave members of the lord's affinity (or circle of supporters) some sense of corporate identity. Robert's tenure of Heanton Satchville meant he could be called upon to fight with his Lord (Courtenay) when needed. The Beaumonts & William Wyke were neighbours and at this time there were many disputes about land. Edward Courtenay also had his personal reasons for not responding to the summons, he felt that the jury were biased and that this was because of the influence of the Earl of Huntingdon, a rival in power. William Wyke had been a servant of the Earl of Huntingdon and the vigour in which the case was pursued indicated it was of political importance. It is interesting that had his cousin Hugh Courtenay , son of his father's brother, lived and had children, he would never have been earl and any such child would have been the nephew or niece of the Earl of Huntingdon and and half niece or nephew of King Richard 11. However, Edward's great grandmother was the daughter of King Edward 1 so he was of royal blood and related to Richard. It is strange that Sir William Esturmy acted as judge it was not his year to be on duty and this was obviously because William Wyke was also his servant, (probably through renting his lands in Wiltshire where he had many large estates) He had married Joane, the widow of Sir John Beaumont who was the mother of William Beaumont and the Beaumont support of the conviction was strengthen by James Chudleigh who was married to Joan Beaumont, another close relative. The Earl's anger was directed against William Sturmy (Esturmy) who he threatened to kill and it could be that his strong resentment was because he was an outsider, although an active speaker in the House of Commons. Towards the other parties was a disappointment that they had sided with him, probably because they were all from local Devon families which he knew well. John Grenville's involvement as Sheriff of Devon was also under scrutiny. He was accused of conspiring with the Earl. John was a kinsman of the Earl through his mother, and he was also married to Margaret Badlesmere, whose sister Maude had married Thomas Chaucer, son of the famous Geoffrey Chaucer of Canterbury Tales, and through these marriages they shared the Burghersh estates when his father in law died in 1391.This upward mobility was obviously achieved through the marriage of Theobald Grenville to a Courtenay. Both John's grandfather Theobald and father Theobald had been knighted by Edward 111 and were Lords of the manor of Bideford. John, was himself knighted by Richard 11, a kinsman. He was a member of the retinue of Edward, earl of Devon, serving at sea from March 1387 under the admiral, Richard earl of Arundel. We do not know who Robert Yeo married, but his son Robert was married to Joan Pyne, and his father, William was Sheriff of Devon in 1354. Robert was Lord of the Manor of Heanton Satchville, in Petrockstowe, Devon and this parish is next to Peters Marland, so the dispute was probably a domestic one. In post-conquest medieval England, land was not owned, in the modern sense, by anyone but the monarch. Instead it was held by tenants, from lords (or occasionally ladies) in return for the obligation to perform some service. This was the feudal system, with the king at the top of the ladder, his direct tenants ( in this case the Earl of Devon) beneath him, and then under-tenants suich as Robert Yeo. Robert would then have rented some of his messuages, small farms or a few acres to the peasant farmers in return for labouring on the land of the local lord. John Langford, named as his servant, would have been one of the latter. Robert held lands in Heanton Satchville, (held by the heirs of William Yeo for 1 knight's fee) which included 16 messuages, 8 carucates of land, 30 acres of meadow, 50 acres of pasture etc and 20s rent there, held of the Kings honour of Okehampton by 1 knights service. worth by the year clear £10 and Frodeston & Meyneston, in South Molton, (Margaret Courtenay's IPM dated 1392) which included 6 messuages 1 toft, 2 carucates of land, 15 acres of meadow and 10 of wood in South Molton which was worth another knight's fee. He and his servant were pardoned by the King in 1397. Robert's grandson William married John Grenville's niece around 1450. Richard 11's Reign (Back to top) What is of interest is the period. King Richard 11, son of Edward, the Black Prince & Joan the Fair Maiden of Kent became king at the age of ten, his father had died in 1376, a year before Richard's grandfather, King Edward 111.. During his minority England was ruled by a council, under the guidance of John of Gaunt, 2 nd Duke of Lancaster and his grandfather, but the young prince was put in the charge of Sir Simon Burley. He led a very lonely life and was more suited to the arts than fighting. When Richard came to the throne the economic and social consequences of the plague were disastrous, land had gone out of cultivation, prices had risen and free labourers were demanding higher wages and the villains of the manors demanded their freedom. Starting in Brentwood, Essex (May 1381) the mob rose against the tax collectors, joined with their colleagues in Kent and thousands of people sacked the City of London. The government lacked any significant military capability and so decided to follow a policy of conciliation with the King meeting the mob and their leader, Wat Tyler, first at Mile End and then Smithfield. The king heard and accepted Tyler's demands and then watched as his bodyguards slew the rebel leader, with or without provocation. Seeing him dead, Richard rode alone into the middle of the rebel host crying: "You shall have no captain but me. Just follow me to the fields without, and then you can have what you want." With that, the rebel hoard left central London and dispersed. Its leaders were subsequently tried and many hanged. Richard had personally seen off the greatest popular threat to the medieval English monarchy; it was an achievement that would not be matched for the remainder of his reign. Richard II appears to have been self-obsessed and aware only of his own needs and feelings. Any slight had to be avenged whilst the king's person sought constant praise, respect and even worship. Impressed by imagery and symbols, Richard adopted the sign of the white hart, financed lavish memorials for loyal supporters and designed for himself a tomb in Westminster Abbey that few could fail to be impressed by. As with so much about Richard, the reality of his leadership failed to rise to the majesty of its appearance . The Lords Appellant Strike, 1387-9 The judgements that Richard II received told him that no minister could be impeached without the crown's agreement and that it was treasonous to limit the royal power. They stated that only the king could choose ministers, that he called and dissolved parliament at his will and that he determined its business. In all, it formed a clear statement of the royal prerogative. So empowered, Richard now charged his opponents with treason. They therefore faced the choice of whether to submit (and face possible death) or to defend themselves. The King's most powerful opponents, the so-called Appellant Lords, now moved against him but claimed to be acting in the interests of the crown and good government. The Appellants represented the traditional noble houses that Richard had always scorned. Thomas of Woodstock, Duke of Gloucester, youngest son of Edward III, brother of Gaunt and uncle to the king, led them. Despite his background, the duke actually had limited income and estates, and had a personal conflict with de Vere over neighbouring estates and authority in Essex. Thomas Beauchamp, Earl of Warwick led the strong family interest that had been the main power in the West Midlands for over a century. Richard II had succeeded in undermining their authority and encroaching on their estates. Richard Fitzalan, the 4th Earl of Arundel, was leader of another powerful family, second only to Gaunt in wealth. Thomas Mowbray, Earl of Nottingham, led a great northern powerhouse and shared the personal rivalry with de Vere. Henry Bolingbroke, Earl of Derby was the son of Gaunt; the same age as Richard II, the two would become bitter foes. The ultimate humiliation came with the execution of four of Richard's favourite knights...' His best friend was Robert de Vere, 9 th Earl of Oxford and he bestowed many gifts and titles on him,In 1386, a group of nobles, jealous of the influence on Richard of certain advisors who were outside the royal circle, forced themselves on the king as a governing council. 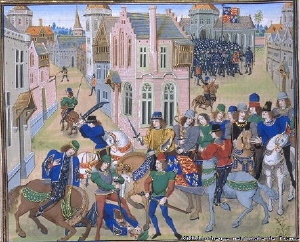 The following year, however, encouraged by Michael de la Pole, Robert de Vere and others, Richard managed to reassert his prerogative, but afterwards there was an armed uprising by the Duke of Gloucester, the Earl of Arundel, the Earl of Warwick and others who appealed of treason these same advisors. There was a military encounter, known as the Battle of Radcot Bridge, between these forces . Robert de Vere fled abroad, but all his estates and titles were confiscated and in his absence he was sentenced to be hung, drawn and quartered. However, Robert died, killed by a boar, in 1392, around the time of this trial, and King Richard was heartbroken. The de Vere's were relatives of the Courtenay family so family loyalties would have been strong. The lords then marched on London, met the king in the Tower, possibly removed him from the throne for a few days and then tried his leading councillors. 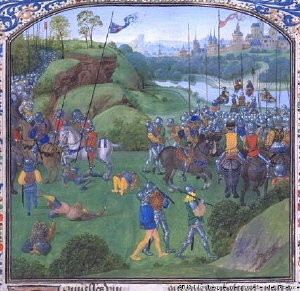 The ultimate humiliation came with the execution of four of Richard's favourite knights, including the beloved Burley. Richard and his queen had both begged for his life to be spared. For a man like Richard this kind of event, and the humiliation that accompanied it, would never be forgotten. The Appellants now controlled the government and were faced with being judged by their own actions as rulers. They failed the test. In 1388 the Scots won a great victory at Otterburn, devastated large parts of the north and faced no reprisals. Attacks on France failed, financial reforms did little to improve government, the Commons became disillusioned and the king's popularity increased. The two peripheral Appellants, Nottingham and Derby, defected to the king on receipt of new offices which meant that in 1389 the king, now aged 22, could declare his own majority and will to rule of his own. The remaining appellants were removed from office as Gaunt returned to bolster the crown. Patronage, Power and Peace, 1389-98. Richard II could finally put his own mark onto royal government and follow his own instincts towards peace, which had the secondary advantage of freeing the king from parliament's hold over financial provision. He could also develop his own idea of a more 'absolute' rule.Using his 1390 Book of Statutes Richard now rebuilt his government, authority and image. He had learnt to create his own loyal retinue, to put trusted men in office and to end the war with France and thereby the crown's dependence on parliamentary grants of taxation to pay for the fighting. The question remained whether or not the substance could match the facade. Gaunt was carefully nurtured until 1394, when the king had gained the authority he needed. He built up the power of a new courtier nobility such as John Holand, his half-brother and Earl of Huntingdon, the new chamberlain and rival to the Courtenays, Earls of Devon. This alienation of yet another powerful local family showed the king had not learnt all the lessons of his minority and would not be forgotten in 1399, when the king was challenged once again. Richard's personal confidence was growing. At court, he insisted on being called Majesty. No-one could look the king in the eye and all deferred to him in a public and effusive way. The council often met daily, kept minutes and actually ran the government. However, these reforms failed to address all the financial problems and the king still spent more than he earnt, due largely to his extravagant personal expenditure. In 1397 he gained a taxation grant without there being the requirements for war, for the first time; a dangerous precedent for the king to rely upon. Peace at home led the government to look abroad and Richard's attention turned to reasserting the crown's authority in Ireland. Richard's revenge, 1397-The last two years of Richard's reign are traditionally described as a period of tyranny with the government levying forced loans, carrying out arbitrary arrests and murdering the king's rivals. Richard's regime went on the offensive exacting revenge for past humiliations and attempting to bring substance to the imagery now associated with the king's rule. The cause of Richard's actions has often been considered a result of the death of his queen, who may have provided a restraining influence. But his tyranny reflected a reaction to a new environment: one of renewed fear. Always carrying resentment against the Appellants, the king now felt threatened again and with the Earl of Huntingdon's help, seized the initiative and had the three senior Appellants, Gloucester, Arundel and Warwick, arrested. Evidence of a plot against the king is unclear but he had every reason to suspect one. Sparked by a long-running dispute between the earl of Warwick and the now loyal Nottingham and the need to fund the French alliance, the king called a loyal parliament. He raised 2000 men in Cheshire, caught the Appellants off guard and tried them in parliament. Warwick was sent to prison, the Duke of Gloucester was probably murdered by Nottingham's men in Calais and Arundel was executed. Evidence of a plot against the king is unclear but he had every reason to suspect one.' The king had his revenge and now handed out a slew of titles and land making, amongst others, Nottingham the Duke of Norfolk and Derby the Duke of Hereford. Rarely if ever had so many high offices been created at one time. Cleverly, Richard went out of his way to split up the estates of the removed Appellants so as to avoid any one nobleman benefiting with too much power; he consciously set out to water down the great houses. In the process the traditional power bases were alienated and the political map of England redrawn. He rewarded the Earl of Huntingdon by giving him the title 'Duke of Exeter'. However, Richard's methods, as usual, proved counter productive. Apart from alienating the otherwise loyal families in the regions who saw the 'new' men attempt to gain interest locally, a general fear entered the kingdom as the king alienated his subjects. For example, he did not go anywhere without his 311 man bodyguard of royal archers, and favour at court once again concentrated on a handful of loyalists that owed everything to the king. The final and fatal crisis of the reign derived from Richard's continuing inability to deal with the nobility. A conflict between the two leading noblemen of the younger generation and the legacies of the death of the most powerful duke in the kingdom led to Richard's fall just at a time when he had never seemed more secure in office. Again, decisions made directly and personally by the king drove events. To summarise, he (Henry Bolingbroke, the new Duke of Hereford, former Earl of Derby and son of Gaunt) fell out with the new Duke of Norfolk (Thomas Mowbray the former Earl of Nottingham) over an accusation of a plot against the two of them by nobles seeking the king's favour. Bolingbroke then swore loyalty to the king in parliament and the king ruled that, unless the truth could be proven, the matter could only be settled on the field of battle between the two dukes. The stage was therefore set for the greatest occasion of chivalry in medieval England - a great joust between the two dukes at Gosford Green in Coventry. However, fearing either lord's victory, Richard II halted the contest before it started and exiled both dukes, Norfolk for life. 'The stage was therefore set for the greatest occasion of chivalry in medieval England...'The crux of Richard's uncertainty and fear derived from the succession and the fact that the 30 year-old king had no heir and had just married a seven year old French princess! Two families possessed strong claims to succeed Richard II: the young Mortimer Earl of March through the senior female line and Lancaster/Hereford through the secondary but male line from John of Gaunt. Needless to say, Gaunt argued that succession to the crown should be entailed to the male line as was increasingly the case for inheriting noble estates. With estates worth £12,000 pa Gaunt was both a potential threat and source of massive patronage if his estates were broken up. In 1398, fearing for their position, Gaunt and his son made the king promise to uphold their inheritance if either died. When Gaunt finally did die, early in 1399, Richard could not resist the temptation to remove a rival and potential heir, and promptly disinherited the exiled but popular Bolingbroke, breaching law and precedent. This was a fatal mistake that underlines the king's limited understanding of what even the 'most glorious' monarch can get away with. On paper, Richard seemed in a very strong position in 1399. The £83,000 dowry from the French crown meant that the king possessed assets for the first time, with over £43,000 in his reserves. The reorganisation of the government around the king's court and the fact that his appointees dominated the nobility and provinces, left seemingly little room for weakness. The marriage treaty had secured peace with France, while the one power in the land who had posed a real threat to Richard's position was dead. Indeed, the king felt so secure that he went marching off to Ireland for the second time, taking his best and most loyal men with him. This expedition achieved little, partly because it was cut short by news that Bolingbroke had landed with a small force in Yorkshire. Stranded in Ireland with no means of returning to Wales and then England, Richard had to watch while the greatest nobles of the land deserted him to join Bolingbroke. Motivated in part by fear for their own inheritances and general antipathy to Richard's rule, the west and east of England quickly fell to Bolingbroke. The king's last hope, the north west, failed to rally to the cause after the fall of Chester, again without a fight. Finally back in Britain, Richard II surrendered in Conway Castle after talks with the Earl of Northumberland, who promised that the king's position would be respected. With the exception of an abortive raid by the remainder of the royal bodyguard, the king passed into Bolingbroke's custody in the Tower, without any further resistance. .Richard had to watch while the greatest nobles of the land deserted him...'Isolated, Richard now heard Bolingbroke's demand that he relinquish the throne and pass it to Bolingbroke by right of succession in the male line, following noble and European tradition. The king resigned under pressure on 29 September 1399, bringing his 22 year reign to an end. Taken to Pontefract castle, the failure of another loyalist plot reminded Henry of Lancaster how great a liability the live Richard II would be. By the end of February 1400, Richard of Bordeaux had starved to death. His passing receiving little contemporary comment or record. Henry Bolingbroke proclaimed himself king and took the throne as Henry IV. Initially buried in Kings Langley, Henry V later placed Richard's body in the tomb that he had designed for himself in the Confessor's chapel of Westminster Abbey. After Henry deposed Richard and took the throne (as Henry IV), he called to account those who had been involved in the downfall of Thomas of Woodstock, and in the end took away all rewards Richard had give them after Thomas' arrest. Thus Holland became again merely Earl of Huntingdon. Early the next year Holland entered into a conspiracy, called the Epiphany Rising , with his nephew Thomas Holland, Earl of Kent , Thomas le Despencer, 1st Earl of Gloucester , and others. Their aim was to assassinate king Henry and return Richard (who was in prison) to the throne. Their plot failed, Holland fled, but was caught and executed. Among those who witnessed the execution was Thomas Fitzalan, 12th Earl of Arundel , son of the Earl of Arundel who Holland had arrested some years before. Holland's lands and titles were forfeited, but eventually they were restored for his second son John Holland, 2nd Duke of Exeter . .Under Henry IV, William Esturmy was one of the commissioners appointed in 1401 to treat with the duke of Gueldres and in 1405 to treat with the grand master of the Teutonic Order and with the Hanse (Fcrd. viii, 189, 395, 396). He acquired many properties, having nearly doubled his original inheritance before his death in 1426 (Cal. Jnq., p. in., iv, 107). He left no son but his second daughter Maud married Roger Seymour great grandfather of Jane, queen of Henry VIII. In 1402, John Grenville was a commissioner in both Devon and Cornwall to proclaim Henry 1v's intentions to observe the laws and customs of the realm and was required to arrest all insurgents. In particular he seems to have had some concern with important military matters. During the Glendower revolt in Wales the King relied heavily on the West Country for men and supplies and Grenville was ordered in September 1403 to take fish, ale, wheat and other victuals from Devon for consumption by the royal forces at Aberystwyth, Cardigan and Newcastle Emlyn. In the following month, along with the earl of Devon and three other members of the Courtenay family, he was ordered to assemble men and embark from Uphill, Somerset, for the relief of Cardiff. When he died in 1412, his estates in Kilkhampton and Bideford passed to his brother, William Grenville, and his widow married John Arundell, the eldest son of Sir John Arundell of Lanherne.